Leslie Imroth was the only son of Gustav Imroth, a minor Randlord involved in the development of the South African mining industry. He was born in 1897, and spent the early part of his life in South Africa, before studying at Westminster School from 1910. He was admitted to Grant’s, as is recorded in both the October 1910 and February 1911 copies of the Elizabethan. He remained at the school for only one year, leaving in 1911. Little is known of his life during this period, and it is not until four years later that further records of him begin. These records report that he joined the army in 1915, serving as 2nd Lieutenant in the 11th Hampshire Regiment. He became Lieutenant in 1916, and served in active duty for two years. He sustained wounds in action in 1918, and eventually passed away in his home country of South Africa, at Johannesburg. He is buried in Braamfontein Cemetery in Johannesburg. Geoffrey Hamilton Hobson was born in 1898 in Brondesbury, London. His father was a ‘Cycles and Accessories’ manufacturer. Geoffrey joined Westminster School from Pamers School in Essex in 1911; his elder brother Eric had started in Grant’s the year before – Geoffrey was in Ashburnham. He left in December 1913 and joined Melle College near Ghent, remaining there until the outbreak of the war. In January 1915, aged just 17, Geoffrey enlisted in the Artists’ Rifles. He went out to the Western Front in August 1915 and then took a commission as 2nd Lieutenant in the 1st Battalion of the Hampshire Regiment in late 1916. His battalion was involved in the two Battles of the Scarpe, part of the larger Battle of Arras in the first half of 1917. The second Battle of the Scarpe took place between 9th and 14th April and it is likely that Geoffrey was wounded in the early stages of this battle and moved to Etaples, near Le Touquet on the north French coast for treatment, where he died in hospital on 14th April. First Battle of the Scarpe. 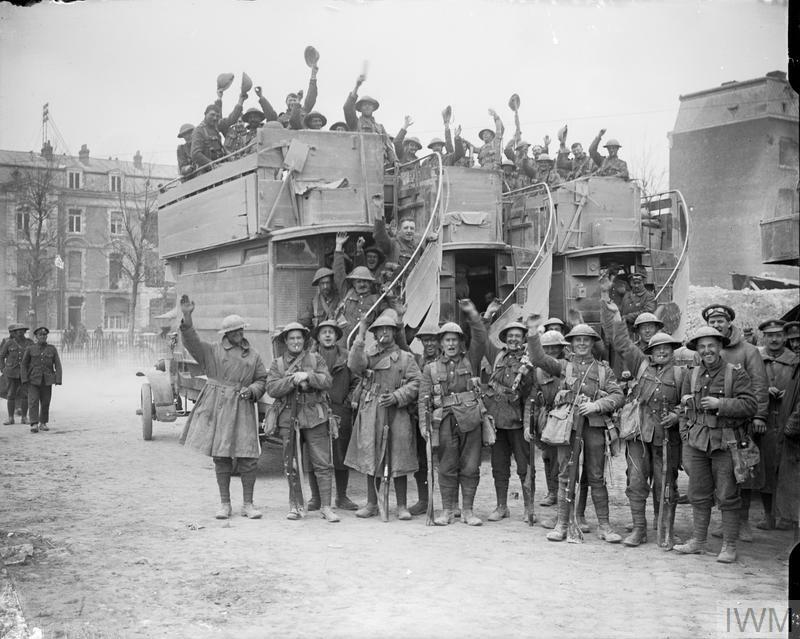 Cheerful British troops boarding London omnibuses at Arras on their return from the capture of Monchy-le-Preux, 11 April 1917. Copyright: © IWM.